One reason you'll love the Advanced Open Water Diver course is that you and your instructor choose from various types of Adventure Dives to complete your course. You can try your hand at Digital Underwater Photography, Wreck Diving, Night Diving, Search and Recovery and much more. Once you have booked the Advanced Open Water Diver Course with DV Diving we will contact you to find the best method of getting your knowledge development materials (PADI's Ultimate Crewpack) to you, whether you pick up the pack in store, require it be posted to you or if you decide to go with PADI eLearning instead. Some of your adventure dives require an additional swimming pool session for equipmentation orientation. 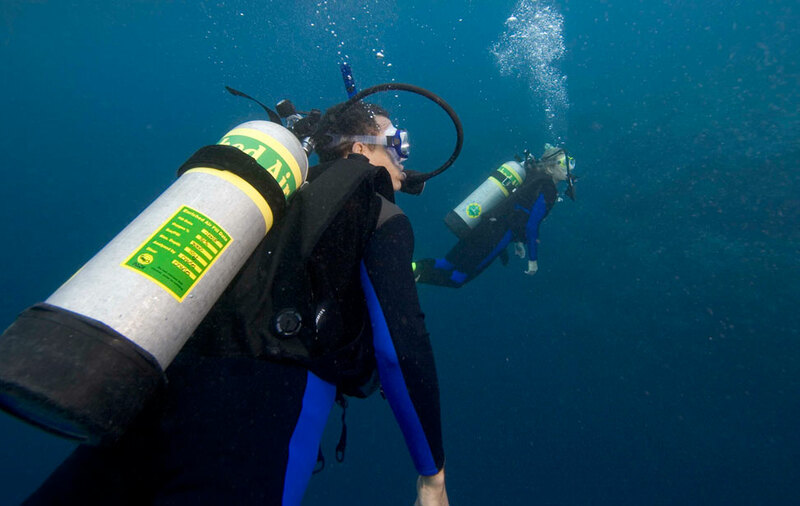 These adventure dives include Drysuit and Full Face Mask and would be held during our weekly pool session on Wednesday evenings at 8pm in the Ards Blair Mayne Wellbeing and Lesiure Complex. The Advanced Open Water dives are completed based on your availibility and are of course weather dependent. For the Open Water dives we meet at the DV Diving centre in Carrowdore, gather any equipment needed and head in various directions to a suitable site. See our dive sites for more information. Includes: PADI Advanced Open Water Diver Course (including Ulitmate Crewpack), Equipment Hire, Suunto SK-8 Compass and MGE Standard Reel. Includes: PADI Advanced Open Water Diver Course (including Ulitmate Crewpack), Equipment Hire, Suunto SK-8 Compass, MGE Standard Reel and extra components to complete either Drysuit Diver Speciality or Enriched Air Diver Speciality. E Learning (online theory) available via PADI E Learning at additional cost of £122.72. If you choose to use PADI E Learning, DV Diving will give you £23 credit towards your Advanced Open Water Course. You use all the basic scuba gear including your underwater compass. Depending on which three adventure dives you pick, you may also be introduced to underwater photography equipment , reels, elayed surface marker buoys, a dive light, lift bags, a dive flag/float or other specialty gear such as drysuit. PADI's Adventures in Diving Manual and DVD provide information on the various types of specialty diving. You'll use them as a guidebook to improve your diving skills and prepare for new experiences and adventures.